Jason Donovan Concert Review - GeekForce | Experience The Power Of The Geek! The age range of the women was 35 to 50 year olds. I can only liken the atmosphere to what I suspect would be a Tom Jones concert, I expect underwear to be thrown on the stage at any moment. I am a 39 year old man at a Jason Donovan concert. Not by choice but because my girlfriend wanted to go. She was probably one of the youngest people there. he was a poster boy to teenage girls all over Britain an appearing on or in Smash Hits on weekly basis. Starting out as an actor on the Australian soap Neighbours in 1986 playing Scot Robinson as an 18 year old his star status soon rocketed with the twice daily showing. These were the days when Neighbours were shown at 10.30 in the morning and then again at 1:30 at lunch. Myself and brothers would watch this in the school holidays and then the BBC changed the times to 1:30pm and repeated again at 5:35 in the evening, straight after Children’s BBC when the Broom Cupboard with Philip Schofield and Gordon the Goffer were at the peak of popularity. The change in times and because it being shown straight after Children’s BBC made Kylie Minogue and Jason Donovan become soap star pin ups prior to their pop careers even taking off in Britain. After Scot and Charlene, Minogue played Charlene Ramsey in the soap, got married in Neighbours and walked down the aisle to Angry Anderson's Suddenly, making this a number one hit in Britain. Kylie was the first to leave Neighbours and have a phenomenal singing career which continues to this day, starting with I should be so lucky. Stock, Aiken and Waterman saw the potential from the Neighbours stars of a musical team up of Kylie and Jason and so in 1988 Especially For You was released, and this was the beginning of Jason’s pop career. Especially For You was followed by a successful solo album in 1989, the biggest selling album in the UK in 1989 in fact, and this is what the stage show was all about. The album that Jason released was Ten Good Reasons and this was the Ten Good Reasons Tour. The whole of the album was going to be performed and because it was nearly Christmas there were a few Christmas song classics and of course hits from the rest of Jason’s career. 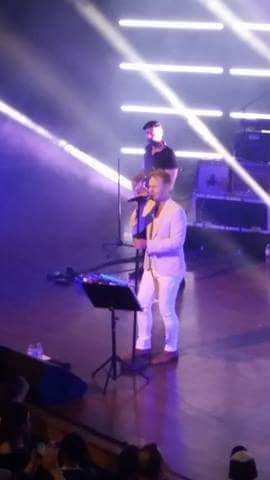 Jason Donovan is a great entertainer in the style of Cliff Richard. I’d say a family entertainer with a bit of a potty mouth. He started the show by telling a joke which was doing the rounds back in 1989 – What has got 250 legs and no pubic hair? The front row of a Jason Donovan concert. Boom boom. But as he said that was a bit different tonight as all the fans from then had grown up and they were all present tonight and it was more Nottingham Forest on that front row. I don’t think you would get this at a Cliff Richard concert. Jason had the audience swaying to the songs and eating out the palm of his hand. Having seen Kylie Minogue in concert a few years ago I can confirm this was a completely different experience. Kylie’s show is slick with choreographed dance routines and about 6 costume changers, by the end of it I was exhausted for her. The Jason Donovan concert has no choreography and one costume change at the interval. In fact I said to my girlfriend after the show that Jason reminded me of Hugh Grant in Music and Lyrics when he is performing at the fete and school, she agreed and had thought the same thing. This is life imitating art as Hugh Grant’s character in Music and Lyrics is a pop star who was famous in the 80s and who lives on the hits he once had in the 2000s. Jason performed all the single releases from the album Ten Good Reasons – Nothing Can Divide Us, Too Many Broken Hearts, Sealed With A Kiss and Every Day (I Love You More). He also played a few of the B-Sides from these singles, the Kylie Minogue duet All I Wanna Do Is Make You Mine. He also played guitar when he sang Rhythm of the Rain and performed that other big hit Any Dream Will Do from Joseph and His Technicolour Dream Coat. Jason finished the concert with an encore of Too Many Broken Hearts, a song he’d previously performed in the set but when it’s a good song and the people have come to see you perform the hits then why not play it twice – and it sums up the album and tour so why not milk it. 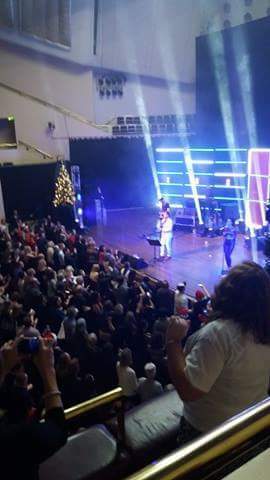 I went away happy that I’d been entertained and my girlfriend went home with a Jason Donovan Christmas jumper and I would imagine those 35 to 50 year old women went home with new memories of their childhood heart throb, and that he didn’t disappoint in giving them Ten Good Reasons to stay.